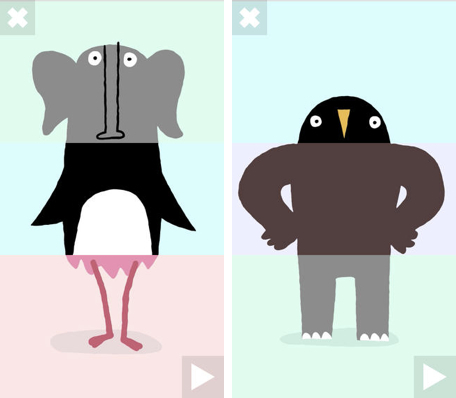 Miximal is a clever learning app from Yatatoy that teaches young children about sounds and syllables. The app uses simple, but adorable animated animal graphics to represent sounds in a flip book-style approach to learning. The app includes a spinner wheel that allows kids to dial in three images as they assemble an animal and its associated word. Each graphic represents a syllable in the word that is repeated audibly when a child presses the "play" button. 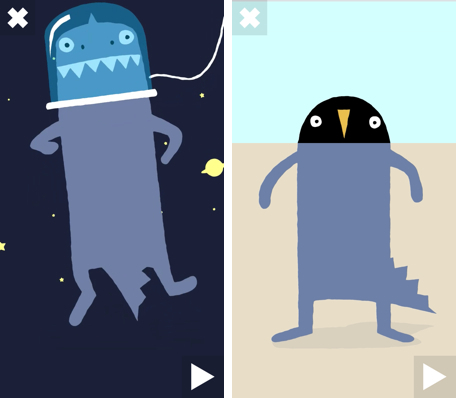 The app is free-form allowing kids to create wacky animals like a "Pen-No-Saur," a penguin head on a dinosaur body and legs. When kids create the real animal, a Di-No-Saur in this case, they are rewarded with a silly animation. Miximal is designed for the kindergarten-aged children and has catchy graphics that'll appeal to that age group. Graphics are simple to select and the buttons are over-sized, which makes them easy to tap. The app does a nice job of balancing interactivity with ease of use. The animations made my 4-year-old giggle, and the app had just enough easy interaction to keep him engaged for short periods of time. There are no in-app purchases, but there is one ad for Yatatoy's other app, Drawnimal. The ad is viewable only on the launch screen and is tappable, but it is locked down with a gesture that requires the user to swipe with one finger to view the content. The "About" section with social links is locked down in a similar manner. Miximal is available in the iOS App Store for $1.99. It is compatible with the iPhone and iPad and requires iOS 6.1 or later. 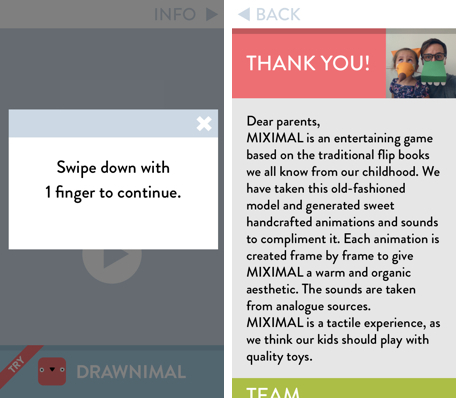 Daily App: Miximal teaches children basic sounds by letting them dial in animals originally appeared on Breaking Apple News, Tips and Reviews from The Unofficial Apple Weblog on Tue, 01 Apr 2014 09:00:00 EST. Please see our terms for use of feeds.